Are you in an area where ready mix concrete is hard to get and the nearest batchplant some 200+ kilometres away from your work site ? …. Perhaps it is time to consider a volumetric concrete mixer and produce your own mix on site and only when required. THE MOBILE MIX CONCRETE METHOD, TECHNICALLY CALLED VOLUMETRICALLY MIXED CONCRETE, WAS INVENTED IN 1960 BY HAROLD ZIMMERMAN, FOUNDER OF ZIMMERMAN INDUSTRIES IN THE US. Mobile Mix Concrete is a technique of mixing concrete whereby the dry ingredients are stored in separate bins on the truck, as opposed to being mixed at a central batch plant. Once arriving on the construction site, the ingredients are proportioned volumetrically by a patented chain feed system and adjustable gate. The ingredients are then mixed in a screw auger while being discharged. The Zim-Mixer is made today in capacities between one and ten cubic yards, and is ready to work on site as soon as the driver adjusts the material feed system to produce the required mix. All product is metered, and production stops as soon as the required volume is produced: there is no waste. Mix designs can be changed to suit requirements, and unmixed material is available for the next run – whenever it is. There are separate bins on a Zim-Mixer for sand, stone, cement, and water, and even fibre reinforcing can be catered for. A numbered dial plate is used for making fast mix design changes, with materials fed through carefully calibrated controls onto a patented material feed chain system. This design is more durable and requires less maintenance than older belt designs. The design also eliminates cement build-up associated with rotary metered cement systems, providing more consistent flow and an improved mix. Zimmerman backs the design with a three-year warranty. The metered materials are fed into a Ny-Hard bladed mix auger that continuously mixes the controlled quantities of cement, stone, sand and water. The accuracy of the mixer meets American Society for Testing and Materials code C-685. 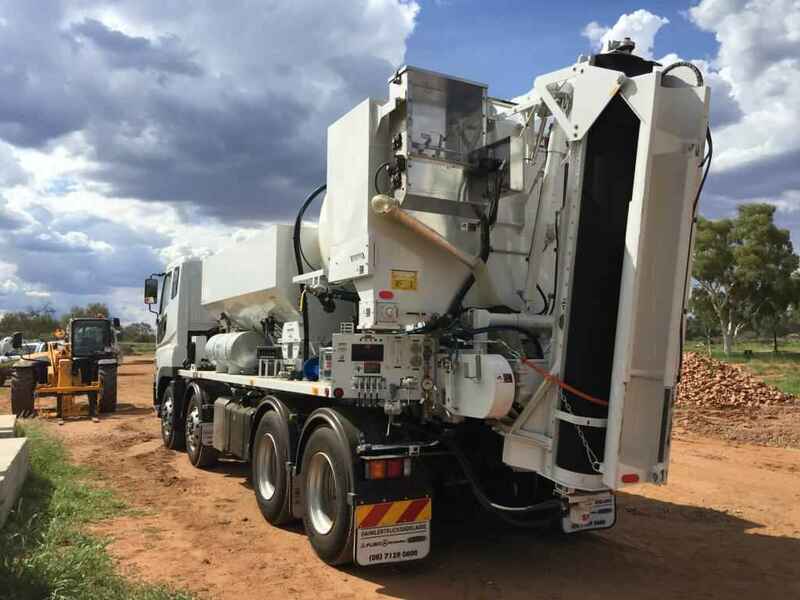 In Australia the Zim-Mixer is represented by South Australian company Concrete Equipment Suppliers Australia Pty Ltd (CESA). Mixers arrive in Australia in kits and can be assembled and fitted to a local truck chassis in as little as five days. For units sold on the Australian market, there are two production rates: 22.5 and 45 cubic metres per hour. There are seven models covering capacities from 3.0 to 8.4 cubic metres. Once in operation, a machine can operate continuously provided there is the demand for concrete and continuity of supply of raw materials. To date CESA has sold machines into North-western Australia, Coober Pedy and Alice Springs. The Alice Spring owner previously used local suppliers but is now able to control his own production when and how he wants it. Some of his contracts can be 500 kilometres from the closest batch plant. He places his raw materials on site and can manufacture low slump to high slump concrete, and even coloured concrete, on the job. He can supply from as little as a barrow load to continuous production at 22.5 cubic meters per hour (or 45 cubic metres per hour if the machine is configured for it). This ability suits work with concrete pumps and the concrete is fresh when used, compared to a delivery from a batch plant that may require expensive additives too remain workable. The Zim-mixer has provided its owner with reliability on remote job sites, with lower set-up costs and no setting up charges. He can produce concrete virtually as soon as he arrives on site. Operation is straight forward, and training is provided as part of each sale. The patented chain feed system on the Zimmerman machine is not only robust but also highly accurate for meeting the specifications required for any site. While most units are truck-mounted, it is possible to mount them on free-standing frames for long-term site operation from a fixed location.